Welcome to the Ember & Co Family! Get excited! You just made a great decision for your business. Right now, there may be a little voice in the back of your head wondering if you've made the right call. Investing in your business (and in yourself) is scary! Did you hire the right designer? Is this really going to benefit your business? Good design will help you bring in more of your ideal customers. Good design will take your goals for your business from dream to reality. Caitlin’s always kind demeanor, reliability, and trustworthiness made working with her an absolute pleasure. She readily recognized needs and gaps and filled them before ever needing to be told to and she was always willing to volunteer herself and put in the extra hours to deliver on those promises. I would recommend Caitlin to anyone that is looking for her skillset." Caitlin is the most consistent, professional, and design-oriented individual I’ve worked with for brand, web, logo, anything design related. She always covers my blind spots, she is always on time, and she wants to earn your business by doing amazing work instead of selling you some jazzy BS that you don’t need or want like many designers." I love Ember & Co! Caitlin is the first person I think of whenever I have any design needs. She is incredibly talented and can take your ideas and truly run with them. She meets deadlines like no one else and always delivers an excellent product. She never ceases to impress." 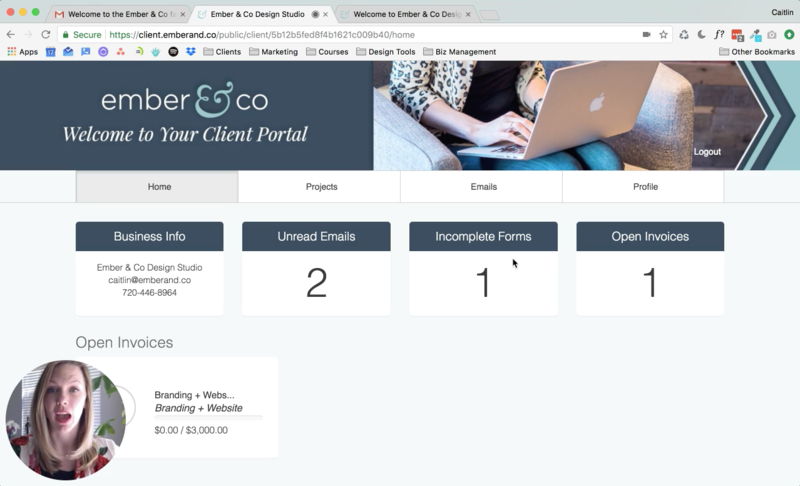 I've filmed a walkthrough of your client portal and ClickUp project below. Feel free to watch at your leisure. It'll show you how to access both, and what to do once you're in there 😉 Both services are 100% free for you and super easy to use. If you have any questions at all, you are always welcome to email me directly at caitlin@emberand.co. You can make checks out to Ember & Co. Traditionally, Ember & Co asks for 30-50% of the total project fee at the start of the project, and the remaining balance before hand-off of the final design. The exact dates are outlined in our contract (if applicable). What if we go out of scope? Should our project grow beyond the scope that was laid out in the contract, Ember & Co will bill accordingly for the extra work requested. Unless otherwise stated, this work will be billed at an hourly rate of $75/hr. What can Ember & Co bill me for? All time spent performing the Scope of Work agreed to upon contract signing, as well as time spent meeting and otherwise communicating is billable. Have comments, questions, or feedback along the way? Check if the answer to your questions is provided on the Ember & Co FAQ page. If not, I am always available to chat! Please keep in mind that I am often immersed in a client project and focused on doing my best work, so I try to minimize interruptions. If you do call, please leave a voicemail. If you don't leave a voicemail, I will assume that you do not need a response. Let's connect on social, too! Thank you so much for your trust in Ember & Co. It is such an honor to do this work with you and I cannot wait to see the magic that we create together! If you have any questions, concerns, or thoughts along the way — please don't hesitate to reach out! I will be in touch with you shortly about our next steps!